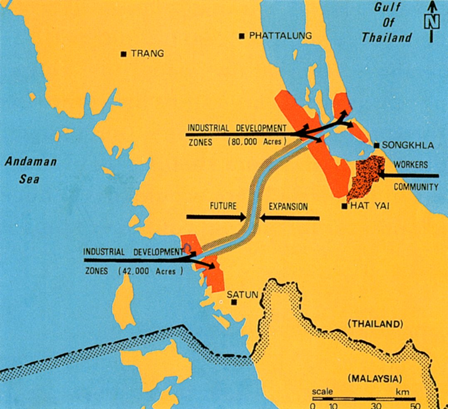 The Thai Canal, also known as Kra Canal or Kra Isthmus Canal, refers to proposals for a canal that would connect the Gulf of Thailand with the Andaman Sea across southern Thailand. It is envisaged that such a canal would improve transportation in the region, similar to the Panama Canal and Suez Canal. Back in 2014, China’s Daily reported that LiuGong Machinery Co. Ltd and XCMG, and private Sany Heavy Industry Co Ltd were beginning preparations on the Kra Isthmus Canal but this was then denied by the companies. Thailand was a step closer to building the Thai Canal by cutting through its chokepoint called the Isthmus of Kra, as China would help foot the bill. If Thailand created it, the canal would shorten voyages from Europe to China by 1,200km and end Singapore’s status as a top sea hub. The shorter route is to build a canal at Kra Isthmus, Thailand. will save shipment costs and time by 1,000 km. A canal through the Kra Isthmus, which would shorten shipping times around Asia, was suggested as early as 1677. Thai King Narai asked the French engineer de Lamar to survey the possibility of building a waterway to connect Songkhla with Marid (now Myanmar), but the idea was discarded as the technology was not sufficient. The idea resurfaced in 1793 as the younger brother of King Chakri (Rama I) suggested it would make it easier to protect the west coast with military ships. In the early 19th century, the British East India Company became interested in a canal. After Burma became a British colony in 1863, an exploration was undertaken with Victoria Point (Kawthaung) opposite the Kra estuary as its southernmost point, again with negative result. In 1882, the legendary constructor of the Suez canal, Ferdinand de Lesseps, visited the area, but Thai king forbid him. In 1897, Thai and the British empire agreed not to build a canal so that the dominance of Singapore can be maintained. Newly proposed route of the Kra-Canal on southern Thailand. China trade with ASEAN is nearing $500 billion per year. In 2011 dollars, the Thai Canal could hypothetically reduce annual oil shipping costs by $49 billion if the entire traffic of the competing straight were diverted, disregarding canal fees and the return trip costs of the empty tanker. 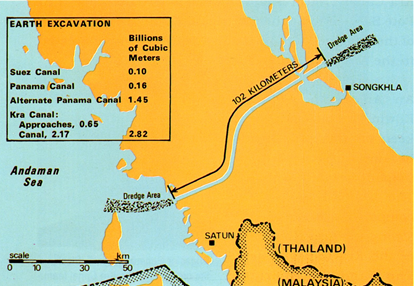 The canal would provide an alternative to transit through the Straits of Malacca and shorten transit for shipments of oil to Japan and China by 1,200 km. China refers to it as part of its 21st century maritime Silk Road. Proposals for the canal in 2015 measure 102 km long, 400 meters wide and 25 meters deep. Singapore-based thinker Parag Khanna’s new book brought an old worry back to life for The Straits Times reader Lum Pak Meng. Mr Lum, 58, said at The Big Read Meet on Wednesday at the National Library Board headquarters that he had read in Khanna’s Connectography that Thailand was a step closer to built the canal that would link the Indian Ocean and the South China Sea directly, bypassing Singapore. This link was first mooted in the 17th century by French developer Ferdinand de Lesseps. The idea of a Kra Isthmus canal has been vetted in modern times since the 1930s, but has never materialized due to high cost and environmental repercussions. Plans for a canal have been discussed and explored at various times, but have not been implemented. Cost and environmental concerns have been weighed against the potential economic and strategic benefits. But will this happen? quite possibly, unless the world market would prefer MADE in Indonesia or any ASEAN produce instead. Next articleSuzuki Ertiga Diesel vs Honda HRV Diesel: Indonesia Diserbu Mobil MPV Sejuta Umat Bermesin Diesel!